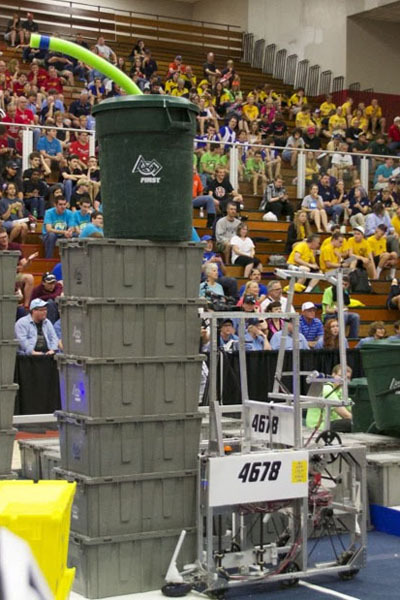 2015 Recycle Rush Robot "Namaste"
Reliably make one stack of 6 (with can and noodle) and one stack of 4 (with can and noodle) in a single match. When the robot goes into drive mode, the operator lifts the arm at the shoulder and crosses them at the elbow creating what looks like the Namaste gesture in Yoga. This was observed by Steve V as drive coach and so from that point on, whenever this neutral position is needed, the drive coach need only yell "Namaste!" 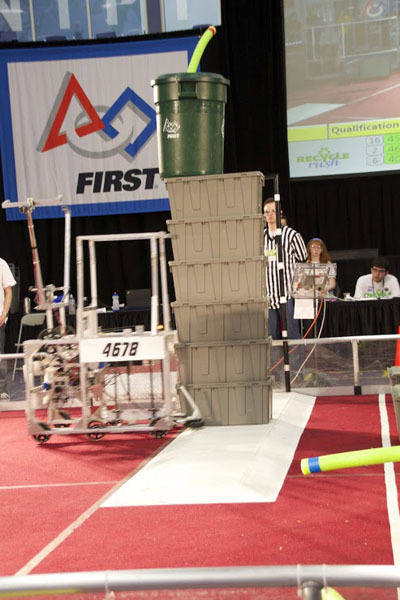 Unofficially refered to as "The Memebot" since team members took to writing clever phrases and memes with a sharpie all over the robot. Even underneath!